The 1889 built tug Valerie K in the Johnston Straits. The story of two engines and five boats. My friend Bill Page has a couple of old marine engines that should be busy pushing boats around. But which boats? The first engine is a Hundested type B/L, 39 HP single cylinder hot-bulb diesel that operates at 425 RPM and has a variable-pitch 31” propeller. The engine weighs 4000 pounds, has a 27” flywheel and stands 50” tall above the shaft line. Bore is 5” and stroke 6.25”. The engine was shipped from Denmark to the US in 1985 and it has run though it’s never been installed in a boat. 30 years old yet still brand new. The second engine is a three-cylinder, 463 cubic inch Easthope, built in Vancouver just after the second world war. At one time this engine powered the William Garden designed (and owned) 62’ Tlingit. It weighs about 1800 pounds, has a forward-reverse gear, idles at 150 RPM, and produces 20HP at about 550 RPM burning 1.5 gph. It will turn a 24” by 26” propeller. When Don, another friend, suggested we needed to find homes for these engines, I started thinking and sketching. 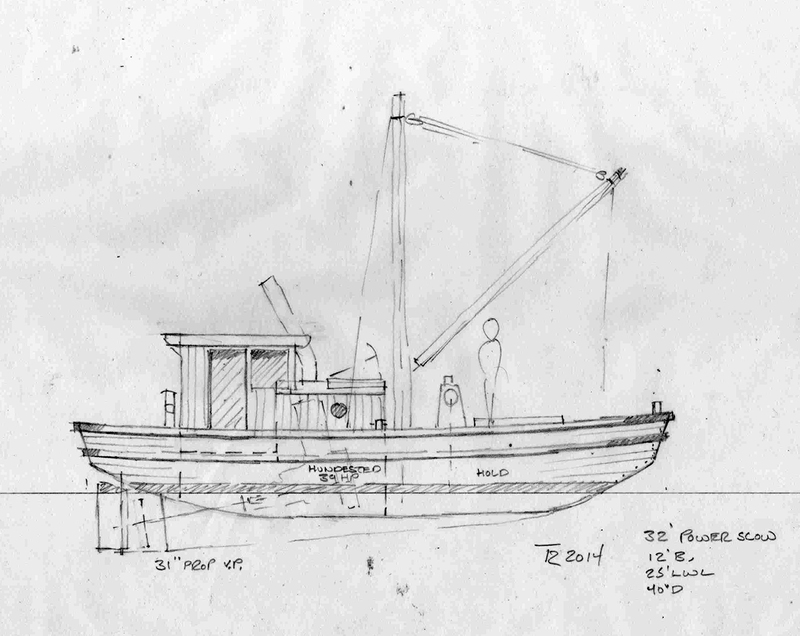 The first idea for the big Hundested was a tug takeoff based on my Dad’s boat the Valerie K. The Valerie K was built at Dickie Brothers Shipyard in San Francisco in 1889. She was originally called the J. W. Dickie and had a 30 HP Vivian installed in 1930. I assume that she would have been a steamer originally. In 1956 she got a 72 HP four cylinder Cummins diesel, the engine which was in her when my Dad had her in the 1960’s at Cracroft Island. Her Gross tonnage was 4.62, Net was 3.14, and registered dimensions were 24’ by 8’ by 2.5’, her official number was 130559. She was actually 2-3’ longer than the official measurement, and she had a beautiful fantail stern completely hidden under water. 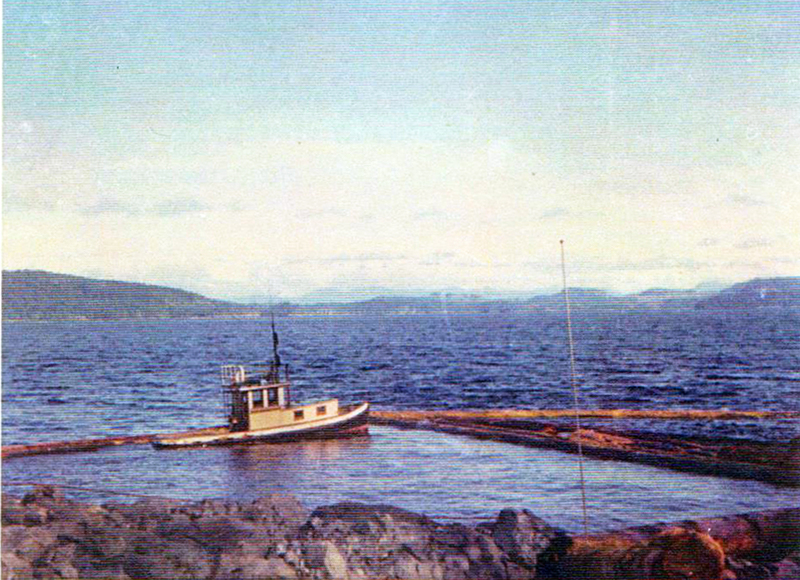 As far as we know she sank and became landfill in Coal Harbour around 1975. But a pure tug can really only do one thing, tow….and in this world versatility is required. 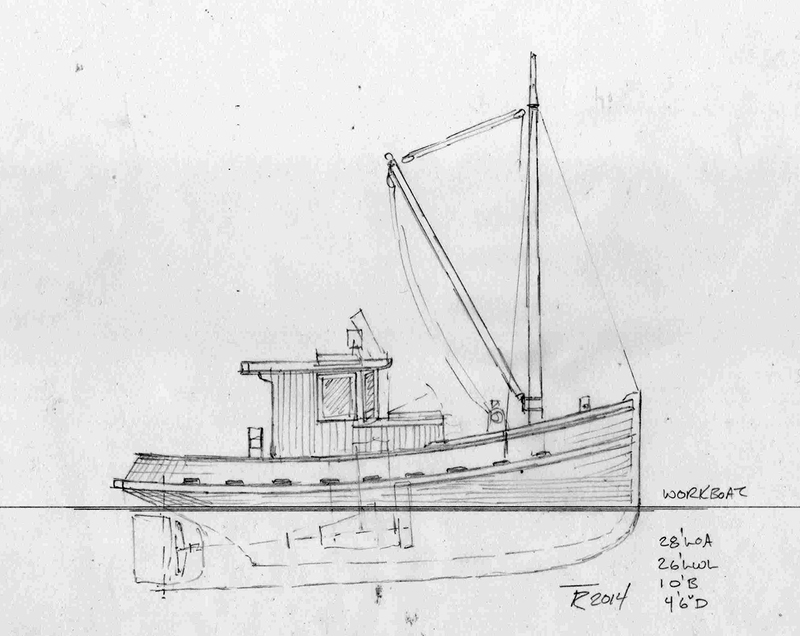 So my second thought was to build a simple big power scow, see the sketch below. 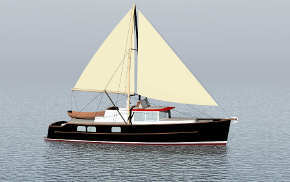 She is 32’ by 12’, all Fir, cross-planked on the bottom with straight planked sides. A house aft over the engine, with the all mechanical controls right at hand, a big mast and boom midships, and towpost aft with deck winch forward to get the work done. Easy to beach and able to carry a load, she could find paying work among these islands and bays. The last idea for the Hundested was an amalgamation of the two previous thoughts. This is a combination traditional tug and workboat, 28’ by 10’ with 4’6” draft. 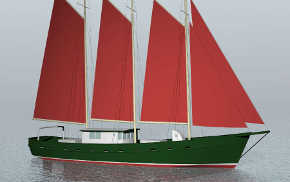 With steamed frames and nailed on planking she would be more complex than the scow, but also a bit showier for the PR appearances. The mast and boom is for lifting moorings and loading freight onto her deck or on the hoped for scow that belongs to a proper tug. Though a bit of a toy compared to the crude big scow, she would still do a day’s work as required. 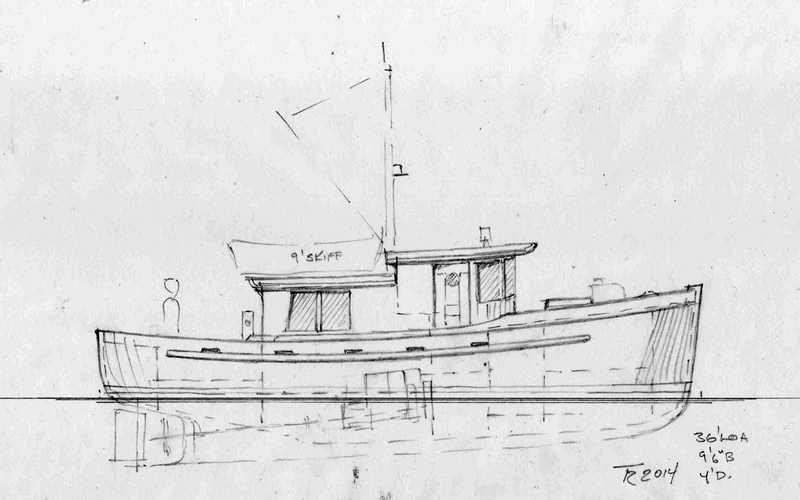 The 36’ double-ended cruiser is a bit of a crossover designed around the big Easthope engine. She has reasonable accommodation, plus a big open cockpit aft with towpost. 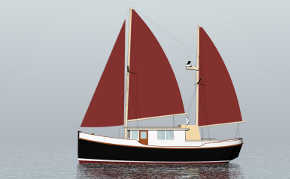 This offers the opportunity to do some work shifting boats etc, but her primary use will be as a home and economical cruiser. Accommodation includes a double berth in the bow, a bunch of storage, a nice pilothouse with seat over the engine, and a galley and dinette with private head arranged aft around the engine. Very simple boats like this used to abound on the BC coast and I’m convinced they can still be created at reasonable cost even today. All that’s required is considerable skill, some dedication, and a non-perfectionist, Fir and cedar and galvanized nails and roofing tar are good enough attitude. I believe this boat could be built new for considerably less than a similar sized (and accommodation) Sea Ray could be purchased for. 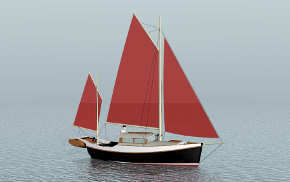 The final boat in this bunch is the 40’ double-ended lapstrake plywood dory below. Inspired in-part by Garden’s Tlingit, this will be a lot easier to handle when it comes to moorage costs. She has absolutely minimal accommodation for her length, all of it wrapped around a big engine room midships. She would slide along in any coastal weather at a steady 8 knots, burning one quarter the fuel those in the their short and fat boats are burning. Living space is split, with sleeping forward and the galley way aft with access to the aft cockpit as an eating area. A pleasant way to visit some coast and pass a few weeks in summer. I just came across this article “Boats designed around old engines”, and I was not aware that Easthope motor still esisted. Last I heard, Bill Garden had arranged a sale to some party back east, by the current owner of Tlingit in California. My Grandfather, Richard Stewart built, and was the original owner of Tlingit. I started running the boat when I was twelve, so I have hands on experience with this motor. If this motor is still in search of a new home I would be very interested.